Such statements are not unique. Rather, these sentiments have formed as part of a consistent narrative that places such moments of brutality within a larger continuum, one that requires an ideological response to a supposed fundamental clash in values, rather than to politically-motivated violence anchored in real-world grievances. This notion has been reiterated by a number of statesmen over the years. Tony Blair led the charge with his rhetoric about defeating ‘the ideology of evil’. Despite a change in government and a commitment to thinking differently about counter-terrorism policy, the Tory and Liberal Democrat coalition continued that line of thought. It has followed through to the Tory majority we have now. To what extent can we make the claim that the government’s current process and thinking is a response to the extraordinary? Could the threat of terrorism, and our response to it, be situated within a longer European historical tradition? In this essay I argue, principally through the prism of two recent works by historian Adam Zamoyski and anthropologist Laleh Khalili, that counter-extremism policies pursued by the UK government, and its counterparts across Europe, are not extraordinary or recent developments, but belong to a long-running historical tradition. Furthermore, since many of the ideas that underpinned the French Revolution were initially identified with specific groups or sects, many of which had emerged in universities, the response of European states to the emergence of such groups was to try to shut them down. Austria was not alone in taking such measures. Similar policies were being put in place across Europe in countries such as France, Germany, Sardinia and Russia, but it was the Austrians who squarely entrenched a formal process of PREVENT-like policing within their society. One of the key insights established by Zamoyski in his examination of this period, is how unqualified the networks employed by the government and police were at their task, many reporting any discussion that began to sound slightly seditious, usually based solely on the informant’s own perspective. The climate of fear haunting the European monarchies reached a peak on 23 March 1819, when Enlightenment philosophy was held responsible for Europe’s first act of suicide terrorism. In Prussia, Karl Ludwig Sand, a student from the University of Jena, entered the home of the renowned author August von Kotzebue, and after a brief conversation, stabbed him several times before plunging his dagger into his own stomach. A Prussian minister, Karl Albert von Kamptz, warned that, “In France there were first Encyclopaedists then Constitutionalists, next Republicans, and finally regicides and high traitors. In order not to have the last types one must prevent Encyclopaedists and Constitutionalists from appearing and becoming established”. Such rhetoric does not simply fail to understand the threats that we face today, from groups such as the Islamic State, but further fails to understand the history of grievance and violence that underpins the threats and responses today. Unlike Zamoyski, Laleh Khalili’s book, Time in the Shadows: confinement in counterinsurgencies(2013), does not shy away from drawing explicit parallels between the past and the present. Indeed, the very purpose of her book is to delineate the continuous trajectory of practices from the colonial period into the present day. What Khalili does so well throughout her work, is link criminal colonial practices, such as mass transportations to prison islands (Malta, the Seychelles, the Andaman islands and Guantanamo Bay), to counterinsurgency theories developed by the very people responsible for such crimes; showing in the process how modern day practitioners, such as David Kilcullen and John Nagl, had learnt from their forebears, notably David Galula. Although Galula and Nagl were referring to two different historical contexts –The effort to crush the Algerian rebellion in the 1950s and the U.S.’s attempts to win ‘hearts and minds’ in Iraq in 2004 respectively– they both understood that these were counterinsurgency operations to be implemented abroad, requiring the quelling of a majority indigenous population. Nevertheless, those very same principles have now been adopted for use in a domestic context, as European countries seek to deploy those very tactics to quell their own potentially seditious domestic populations. Indeed, the current UK government’s counter-extremism strategy seems to borrow a great deal from the ideas of past counterinsurgency efforts. For instance, the notion of “behaviour-modification” is at the heart of the UK government’s vision, once again focusing purely on the notion of ‘values’ rather than the grievances that underpin political violence. Gove’s suggestion is very much in keeping with British colonial practices, particularly in India during the late 1800s, where the Indian Muslim subject was treated with a great deal of suspicion. The parallel is not accidental: It’s worth remembering that the British government responded to the Indian Sepoy rebellion of 1857 – a specific act of violence within a specific political paradigm – not by addressing the root causes of the rebellion, but by launching a commission, led by WW Hunter, into the “ideological struggle”. This description is particularly interesting as it betrays the extent to which the British Raj was obsessed with the notion of ideas being particularly problematic, an obsession that has returned in the age of the “War on Terror”, except that what was once called “sedition” is today called ‘radicalisation’ or ‘extremism’. Far from reflecting a historical curiosity, these remarks seem eerily current. Indeed, it’s hard not to imagine today’s UK government taking issue with the content of these books. The European response to the terror threat today, like that adopted within the context of colonialism, present no departure from the trajectory begun with the French Revolution. Rather, it is only the ideological target of the response – i.e. the type of ideas deemed contentious – that has changed: First it was the Enlightenment philosophy, then anti-colonialist ideas, then Communism, and now what policymakers term ‘Islamism’ or ‘political Islam’. What is consistent across all of these perceived ‘threats’, is the methodology invoked in order to quell them, with the focus nearly always being on identifying and stopping a nefarious ideology. That the same countries that later embraced the Enlightenment are today using precisely this same xenophobic and fear-mongering tone – including the Muslim threat – to rally their publics around an ideologically-rooted response to political violence, reveals a wilful refusal by Europe’s elite to learn the lessons of their own history. 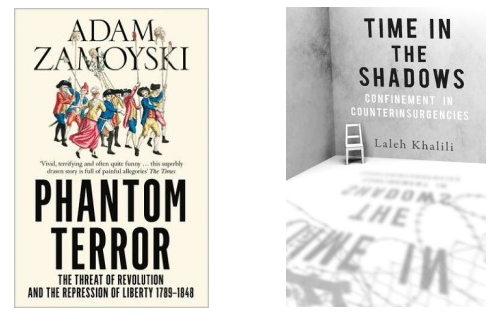 In their own respective ways, both Zamoyski and Khalili offer us insightful new ways of thinking about European history that can and should inform our responses to events such as the attacks on Brussels and Paris. Building a war around the notion that it is “values” that are under attack, and obfuscating the socio-political context within which ideas exist and operate, undermines our very ability to seek reasonable solutions to the issues. The post-French Revolution period witnessed an era of extreme repression; including the suspension ofhabeas corpus, installation of the security state, and widespread suppression of civil liberties, ultimately leading to further disenfranchisement. During the colonial period, these measures were taken to a completely new level, as the principles of counterinsurgency became entrenched. The War on Terror has resurrected and redeployed many of these same practices, the latest being the ideological drive against ‘extremism’. Today, it is surely time, more than ever, to rethink the way we approach the issue of political violence, and to refuse to let our fear determine our response. This entry was tagged Adam Zamoyski, Asim Qureshi, British colonialism, Corporate European Observatory, counter-extremism, Ideology and Fear, Laleh Khalili, Michael Gove, Phantom Terror, Terrorism and European history, war of ideas, William Wilson Hunter. Bookmark the permalink.